Democratic nominee Gavin Newsom mocked the president over obstruction of justice, while his GOP rival pleaded for civility in the race. WASHINGTON — A Republican businessman backed by President Donald Trump will face Democrat Gavin Newsom in the California governor's race in November after a weak showing in the primary Tuesday by former Los Angeles Mayor Antonio Villaraigosa, according to an NBC News projection. Newsom wasted no time framing the fight as one about Trump. Newsom, the lieutenant governor, quipped that in California, "We don't obstruct justice — we demand justice." 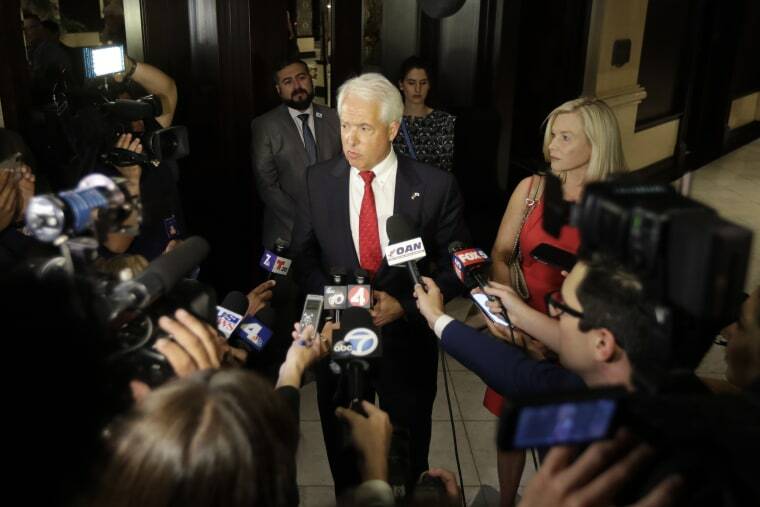 Having GOP hopeful John Cox in the battle is a relief for beleaguered California Republicans, who had risked not landing any candidates on the top of the ticket for the general election this fall, which could hurt turnout in key House races. Under California's unusual "jungle primary" system, the two candidates with the most votes from either party in Tuesday's contests advance to November. Democrats have been spending millions of dollars to try to prevent their own candidates from getting "locked out" by two Republicans in a handful of Southern California congressional districts that should be winnable in the fall. While not all votes are in, Democrats began to breathe a bit easier by Wednesday morning as it became apparent that the party's candidates would likely clear the hurdles to make it to the November election in a handful of key House contests. Still, some races remain too close to call. Since California accepts absentee ballots that arrive after Election Day, as long as they were postmarked on time, it may take days or even weeks to determine the winners in neck-and-neck contests. With 95 percent of precincts reporting, Newsom, a former San Francisco mayor, had 34 percent, or 1,430,985 votes, while Cox had 26 percent, or 1,105,595 votes. Villaraigosa was headed for a distant third place — an embarrassing finish for a well-known Democrat who vastly outspent Cox. One group of wealthy charter school advocates spent over $13 million on TV ads for Villaraigosa, according to Advertising Analytics. Cox told his own supporters he'd wage a high-minded contest against Newsom. "I want to give the voters of this great state the race they deserve. Serious, substantive, and for heaven's sake, civil," he said. In other races, Sen. Dianne Feinstein, D-Calif., won by far the most votes in her quest for a fifth term, while former state Senate president Kevin de Leon, another Democrat, managed to beat back Republican challengers to capture the No. 2 spot, according to an NBC News projection Wednesday. More than 118,000 voters were left off the rolls in Los Angeles County, due to a printing error that affected voting rosters in 1,530 of the county's precincts. Los Angeles County Clerk Dean C. Logan said in a statement Tuesday night that voters whose names did not appear on rosters were issued provisional ballots and those ballots would be counted. Meanwhile in New Jersey, Democratic Sen. Bob Menendez, who recently escaped conviction on federal corruption charges in a mistrial, showed signs of weakness Tuesday as he underperformed expectations against a largely unknown primary rival. In the general election, Menendez will be challenged by Republican Bob Hugin, the former CEO of a pharmaceutical company, who has already spent $7.5 million of his own money on the race, including on ads attacking Menendez on ethical issues. Alabama, Iowa, Mississippi, Montana, New Jersey, New Mexico and South Dakota all held their own primaries Tuesday — the biggest voting day until the Nov. 6 election. Rep. Martha Roby, R-Ala., was forced into a GOP runoff with an opponent who has accused her of "(turning) her back on President Trump when he needed her the most." Roby withdrew her support for Trump after the release of the "Access Hollywood" tape during the 2016 presidential campaign. She will face former Democratic Rep. Bobby Bright, who lost the seat to Roby, but has switched parties and is now trying to reclaim office as a Trump loyalist. And in Iowa, Sen. Bernie Sanders, I-Vt., was dealt a blow in the key presidential battleground state when his former state director finished in a distant third place in a Des Moines-area congressional primary. Sanders cut an ad for Pete D'Alessandro and stumped for the Democrat, who also had the backing of the Sanders spinoff group, Our Revolution. In another Iowa district, Democrats nominated Abby Finkenauer, 28, who would be the youngest woman ever elected to Congress if she wins the GOP-held seat in November, when it is considered a top pickup opportunity for her party. In Montana, Sen. Jon Tester won the Democratic nomination and will face Republican state Auditor Matt Rosendale, who won his party's backing Tuesday. The race will be a crucial battleground for control of the Senate this year.